JR Motorsports to field talented young driver in the No. 9 Chevrolet. 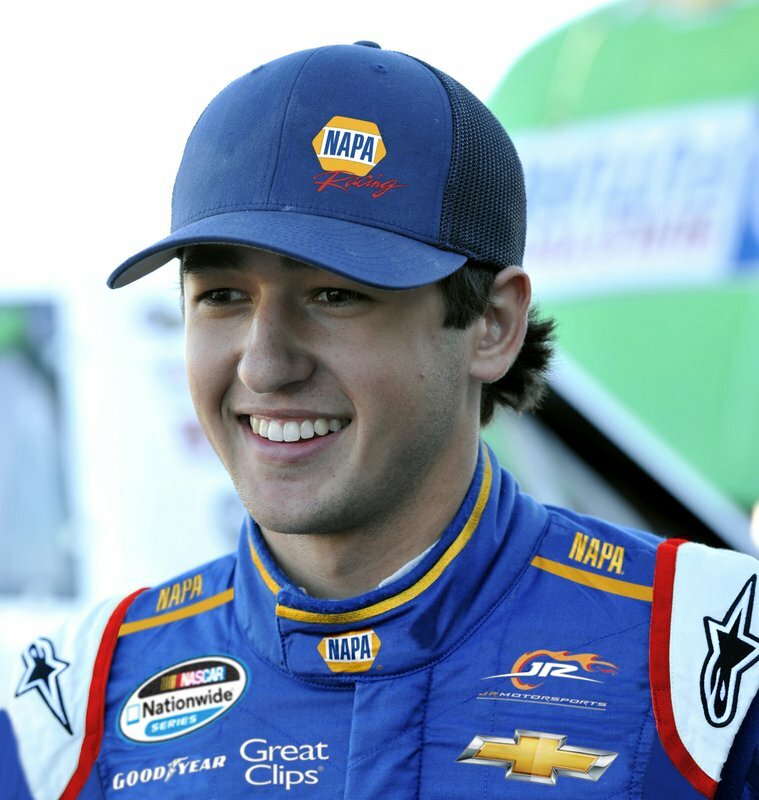 MOORESVILLE, N.C. (Jan. 6, 2014) – Driver Chase Elliott will compete full time in the NASCAR Nationwide Series for JR Motorsports starting in 2014 and do so with NAPA AUTO PARTS as his full-season primary sponsor, the team announced today. With Elliott as its driver, the 2014 season will mark NAPA’s 19th in NASCAR sponsorship. NAPA (National Automotive Parts Association) has more than 6,000 stores nationwide with more than 400,000 quality parts and accessories for automotive and industrial applications – the most extensive inventory in the industry. NAPA headquarters is in Atlanta, Ga., just a short distance from Elliott’s hometown of Dawsonville, Ga.
Elliott will carry the No. 9 on his NAPA Chevrolet – the same number his father, legendary racer Bill Elliott, carried for much of his storied career that included the 1988 Sprint Cup Series championship. The 2014 season will mark the younger Elliott’s Nationwide Series debut. He turned 18 on Nov. 28, becoming eligible for competition. “This is the opportunity of a lifetime,” Chase Elliott said. “My family and I are still trying to believe it all. I couldn’t ask to be partnered with anyone better than Dale Jr., Kelley and Mr. Hendrick, along with all of the people at their organizations who have put in countless hours to pull this together. Elliott’s ascent through super late models and other national touring divisions is decorated with wins and accolades. The Georgia Racing Hall of Fame named Elliott its 2013 Driver of the Year after winning the All-American 400 at historic Nashville Fairgrounds and becoming the first driver to win all four super late model majors. “Chase has been extremely successful, and I think the Nationwide Series is only a short step for him,” said JR Motorsports owner Dale Earnhardt Jr. “With the infrastructure we have at JR Motorsports and our close-working partnership with Hendrick Motorsports, we have every opportunity to continue Chase’s development as a driver while contending for a championship. He’s that good. The addition of Elliott and the No. 9 NAPA team gives JR Motorsports two full-schedule teams to compete for a championship in 2014. Regan Smith and the No. 7 TaxSlayer.com team will return after a 2013 run of two wins. JR Motorsports will also field two partial-schedule teams – the No. 5 with Kevin Harvick and the No. 88 with Earnhardt Jr. Greg Ives will serve as Elliott’s crew chief on the No. 9, with Ryan Pemberton taking over the No. 7 and Ernie Cope the No. 5. By taking on the full 33-race schedule, Elliott has the chance to become only the fifth multi-generational NASCAR champion, as only Richard Petty (Lee Petty), Larry Pearson (David Pearson), Dale Jarrett (Ned Jarrett) and Earnhardt Jr. (Dale Earnhardt Sr.) have accomplished such a feat. Bill Elliott’s 1988 Sprint Cup title came during a season in which he recorded six of his 44 career wins. Known affectionately as “Awesome Bill from Dawsonville,” Bill Elliott is a two-time winner of the Daytona 500, a member of the Motorsports Hall of Fame of America, and a 16-time winner of NASCAR’s Most Popular Driver Award. Elliott signed with Hendrick Motorsports when he was just a freshman in high school. Since 2011 his family-owned team, Bill Elliott Racing, has received support from the Rick Hendrick-owned organization while it toured super late model, pro late model and NASCAR regional events. Hendrick Motorsports fielded a truck for Elliott in nine Camping World Truck Series events in 2013, to which he finished sixth or better in his first six races. That included his victory in the Chevrolet Silverado 250 at Canadian Tire Motorsports Park on Sept. 1. “Chase is the genuine article,” Hendrick said. “It’s been fun to see him grow, and all the credit goes to Bill and Cindy for how they’ve guided him. He’s a real talent, and his next steps will be exciting to watch. ABOUT JR MOTORSPORTS: JR Motorsports is the management company and racing operation for Dale Earnhardt Jr., NASCAR’s 11-time Most Popular Driver and winner of more than 40 NASCAR-sanctioned races. JR Motorsports competes in multiple racing divisions, including the NASCAR Nationwide Series, in which it has earned 12 victories since its inception in 2007. In 2012 the JRM late model program won the track title at Motor Mile Speedway with driver Josh Berry, giving the company its first championship. To learn more about the organization, its drivers and its sponsorship opportunities, visit www.jrmracing.com. This is awesome news! Cannot wait to follow his success!